The TMJ & Sleep theraphy center of San Diego is the only facility in San Diego to recive accreditation from the American Academy of Dental Sleep Medicine (AADSM). Jana Pereira, Jana has 5 years of experience in the Dental field and came to the TMJ & Sleep Therapy Centre in the Summer of 2016. She enjoys helping all of our patients live a healthier life. Seeing smiles on their faces after they are relieved of their pain is the most rewarding part of her day. She is a local San Diegan that loves to spend time with her dog, hiking, going to the beach and just generally being outdoors. Veronica Ledesma, Veronica is originally from a small town called Gilroy, CA., the Garlic Capitol of the world! She began her Healthcare Career at a young age. Today she nearly has 20 years of experience in the Healthcare Industry. Veronica has spent the last several years working as an Educator in a college sharing her knowledge with students. 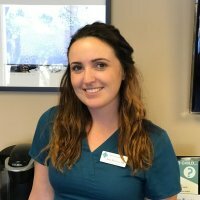 Her solid healthcare experience and passion for helping others will ensure that you receive excellent customer service as a patient at TMJ and Sleep Therapy Centre of San Diego. She loves to help others and welcomes every patient with a warm sincere smile. In her spare time, Veronica enjoys spending time with her three children and taking family trips. She looks forward to her Sunday family dinners and evening family chats while drinking a cup of coffee.